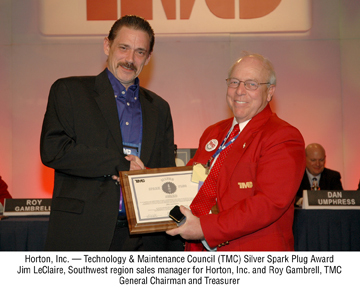 Jim LeClaire, Southwest regional sales manager for Horton, Inc., was awarded the Silver Spark Plug Award from the Technology & Maintenance Council (TMC) of American Trucking Associations. The award is presented to individuals who have given outstanding service to TMC and contributed to the improvement of equipment, maintenance, industry-related technology and management practices in the commercial motor vehicle industry. LeClaire was one of five recipients of the award, presented Feb. 20, 2012, in Tampa, Fla., at the TMC annual meeting. Since the Silver Spark Plug was established in 1968, 189 individuals have received the award. The premier society for truck equipment technology and maintenance professionals, TMC is a technical council of American Trucking Associations, the largest national trade association for the trucking industry. As regional sales manager for Horton, LeClaire is responsible for Arizona, California, Hawaii and Nevada. LeClaire rejoined Horton in 2011 and previously spent 16 years with the company as national accounts sales manager, warranty manager, field service director, warranty and field service supervisor, and research-and-development laboratory supervisor. Prior to rejoining Horton, LeClaire was director of sales and marketing for Combustion Technologies USA, LLC, in Sandy, Utah. He also established and was principal of Transportation Operations Professionals, Inc. (T.O.P., Inc.), and 4 Truck Parts, Inc., of Flower Mound, Texas. T.O.P. is a transportation industry executive advisement, business development and consultancy company. 4 Truck Parts is its truck parts subsidiary. LeClaire began his career as a light/heavy towing recovery operator, and auto and truck mechanic/technician. He attended Cardinal Stritch University. LeClaire has been a member of TMC since 1994, including chairing task forces in the S3 Engines Study Group. He has been a panelist and organizer of technical sessions, and has appeared on the council’s SiriusXM satellite radio program “Tech Talk with TMC.” LeClaire is a leader in the council’s mentor program for new members and has been a recipient of the Recognized Associate and Gerri Murphy Membership Leadership Awards. With over 60 years of industry experience, commitment to service, reliability and innovation, Horton is a premium worldwide provider of fan drives, fans and suspension products. Horton’s comprehensive research and development processes are driven by a dedication to exceed industry requirements today and in the future. The company has manufacturing plants in the United States and Germany, with licensed manufacturing facilities in Australia and the United Kingdom; offices in the United States, Canada, Mexico and Germany; and representatives in Brazil, Chile, Russia, South Korea, China, India and Australia. Horton products include VMaster® and Stratis® Viscous Fan Drives, VMaster Di and Stratis Di Viscous Fan Drives and Controllers, DM Advantage® On/Off and Two-Speed Fan Drives, Arctis® Two-Speed Fan Drives, Electromagnetic On/Off Fan Drives, WindMaster® Revolution High-Efficiency/Hybrid-Flow Fans, WindMaster Fans, WindShift™ Modular Fans, Shogun™ Modular Fans, Klondike Series® Replacement Fan Clutches for the Kysor® K22RA and K26RA as well as repair kits for Kysor’s K26RA, K22RA and K22FA, PolarForce® Two-Speed Conversion Kits, DM Advantage® Conversion Super Kits, Genuine Horton repair kits, remanufactured fan drives and Roller Bushing Suspension Products.